Still a couple spots for Beginner/Started. 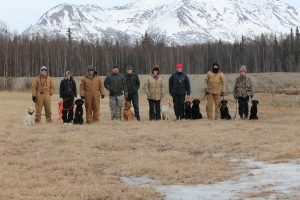 The Midnight Sun Gun Dog Association is happy to announce that it will once again be teaming up with Baron Rea of Wetland Retrievers and conducting retriever training classes this winter. The classes will take place in the Matsu Valley and start November 10th. Class dates will be as follows, November 10, 17 and 24th. The December dates will be the 15th, 22nd and 29th. And the final class will be held on January 5th. The advanced class will begin at 10 am, and the started class will begin around noon. Each class size will be limited to 12 handlers. The cost to attend all classes will be $100 for current MSGDA members or $125 which will include a 2019 MSGDA membership. Please contact MSGDA by emailing webmaster@msgda.org with any questions. Please get the word out to anyone who you think may be interested in these training opportunities.